Craig Curran joined Dundee United from Ross County in the summer. Ross County co-manager Stuart Kettlewell needs no warning about the threat posed by Dundee United’s former Staggies attacker Craig Curran tomorrow. 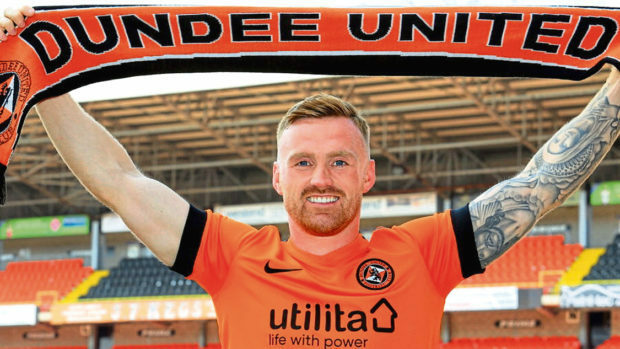 English attacker Curran left Victoria Park in the summer after netting 29 goals in 118 appearances over three-and-a-half years, opting to join Csaba Laszlo’s Tangerines. Kettlewell and fellow co-manager Steven Ferguson were keen to retain Curran following County’s relegation from the Premiership, with the Staggies claiming they were unable to match the terms offered by United. Curran has netted twice in six matches for his new club so far, and Kettlewell says his side must be on guard in tomorrow’s Championship match at Tannadice. Kettlewell said: “Craig doing well at Dundee United doesn’t surprise me. “He was a player we tried to keep at our club, there’s no secret in that. “I enjoyed a really good relationship with him, he’s a great lad to have in and around the dressing room. “You know what you get from him – every ounce of energy and quality he can give on a Saturday. He gives absolutely everything. “That’s why we wanted to keep him. As it transpired, Dundee United was maybe a slightly more lucrative option for him than what we could offer. “As such, it was an amicable situation and we’re not criticising Craig for going to a club of the stature of Dundee United. “There are a lot of boys still friendly with him here, but in a footballing sense he is one we know we’ll have to watch on Saturday, should he play. Among the strikers brought in to fill Curran’s void is former Dunfermline attacker Declan McManus, and although he has been in and out of the side in recent weeks, Kettlewell feels the 24-year-old is progressing well. He added: “Declan is brilliant to work with. Every day he wants more from himself and is trying to improve – he knows he isn’t the finished article. “From a coaching point of view, it is always good to work with individuals like that. It is the type of thing that puts a smile on your face coming off the training pitch. “It might not always work, but there is a desire from Declan to become a 20-goal a season striker and become somebody who can ply his trade at the highest level.